Liam testing with Ducati SC at Valencia! That's Right Baby! I'm leaving Sunday, March 26th, to travel by train to Valencia, where I will work with the Ducati SC Caracchi team for a three day test at the circuit! This is a fantastic opportunity for me, and I will do my best to secure a postion within a World Championship caliber team. Under the guidance of their master mechanic, Franco Farne, I hope to learn as much as possible in three short days. Hopefully I've done my homework, and they choose to continue working with me. 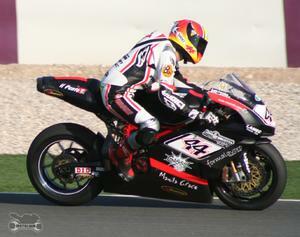 I will be working on bikes for Roberto Rolfo in Superbike, and Joshua Brookes and Luka Nedog in World Supersport. I'm scared, nervous, and most of all, excited. Ducati SC Caracchi is a very well respected team in the World Superbike Championship, and they are proven race winners, last year with Lorenzo Lanzi, and the previous year with Garry McCoy. They know how to win, and I hope to contribute to that tradition of winning success!